One driver who was stranded for more than 12 hours said they cycled the car on an off to conserve fuel as they waited for rescuers to reach them. AURORA, Colo. — First responders resumed their search and rescue operations for drivers left stranded early Thursday morning by the "bomb cyclone" but it's unclear how many people might still be stranded on different roadways across the state. Wednesday's storm brought such strong winds that rescue attempts were made nearly impossible due to blowing snow, low visibility and snowdrifts several feet deep. Around that same time, the Colorado National Guard said they had rescued 93 people and two dogs using their vehicles. They had checked out about 250 abandoned vehicles. One driver told us on Facebook that he had been stranded in his vehicle since 2 p.m. Wednesday and was finally rescued by members of the Colorado National Guard just after 5 a.m. Thursday. That driver didn't want his name used but said he works in Aurora and was headed home to Elbert County when he became stranded on Highway 194. He said he left around 11 a.m. and was hoping to beat the storm home. It took him until about 2 p.m. to get halfway through his commute, which is typically about 35 minutes. He told 9NEWS over the phone that he stopped to pick up another driver whose vehicle had become stranded. At one point visibility was so bad that his new passenger was sticking his head out the window in an effort to locate the side of the road so that they would not go off the road. Eventually, though his vehicle became stuck too, and they were picked up by another driver. In his immediate area, he said he could see at least six other vehicles some of which were facing the wrong direction. They called the Rattlesnake Fire Department but conditions were so bad that rescues were impossible. He told us they were down to about a quarter tank of gas and turned the car on and off to conserve fuel. "Running truck for about 30 minutes or so and then shutting it off for an hour," he said. They had snacks and water during their ordeal but did not have blankets. "I made a list, I will be prepared next time," he said. Finally, around 4 a.m. rescue efforts resumed. They watched two other rescues and just after 5 a.m. it was finally their turn. 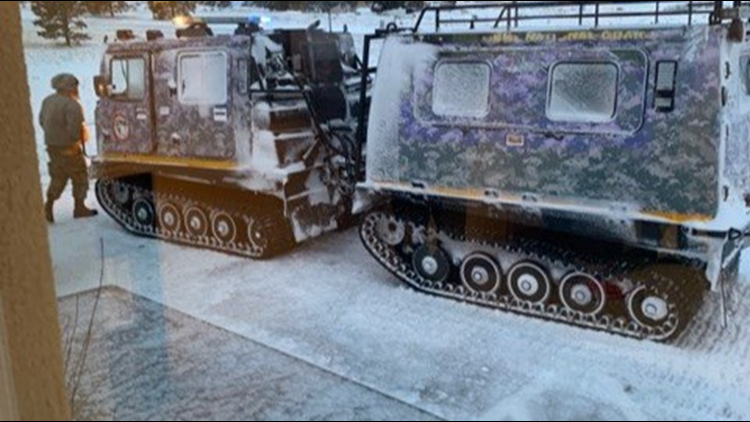 They were picked up in a snowcat by members of the Colorado National Guard. "They did their job, came and got us." He said at least 30 other drivers who were rescued were also at the Rattlesnake Fire Department Thursday morning. He wasn't sure what was in store for them but was happy to be inside. Wednesday afternoon, Gov. Jared Polis verbally declared a state of emergency and authorized the Colorado National Guard to help with the rescue of stranded drivers. "Governor has authorized the activation of the Colorado National Guard and declared an emergency due to the storm that is currently impacting the Front Range," a statement from the Governor's Office reads. "The Colorado National Guard will be activated for search, rescue and life safety operations. The Colorado Emergency Operations Center, coordinated by DHSEM, along with CDOT is working with local counties to prioritize the most immediate needs for those resources." In a Tweet around 11: 30 a.m. Thursday, Aurora police said they rescued well over 200 Wednesday night and beginning to clear abandoned vehicles off roadways in their designated snow routes. They planned to start on East 56th Avenue near Jackson Gap. Vehicles abandoned on the snow routes may be subject to towing, Aurora police said. Anyone who believes their vehicle was left in those areas should call 303-739-6319. That phone line will be answered from 10:30 a.m. Thursday until at least 6:00 p.m., and again Friday from 8 a.m. until 6 p.m. Aurora police provided additional information for vehicle owners on their Facebook page.